What this report finds: In 2015, CEOs in America’s largest firms made an average of $15.5 million in compensation, which is 276 times the annual average pay of the typical worker. While the CEO-to-worker compensation ratio is down from 302-to-1 in 2014, it is still light years beyond the 20-to-1 ratio in 1965. The drop in 2015 primarily reflects a dip in the stock market and not any change in how CEO pay is being set. Therefore, CEO pay can be expected to resume its sharp upward trajectory when the stock market resumes rising. Why it matters: Exorbitant CEO pay means that the fruits of economic growth are not going to ordinary workers since the higher pay does not reflect correspondingly higher output. 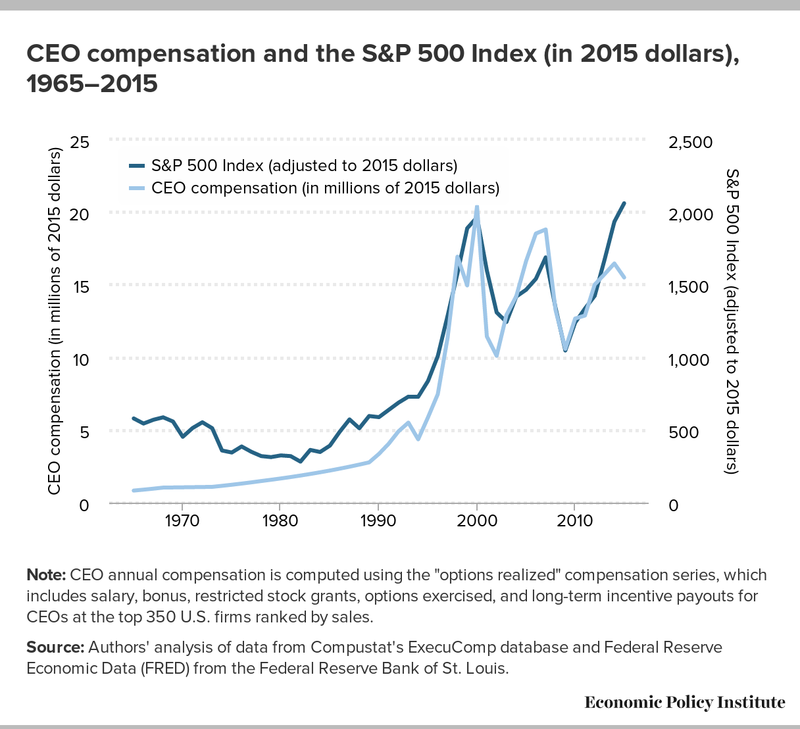 From 1978 to 2015, inflation-adjusted CEO compensation increased 940.9 percent, 73 percent faster than stock market growth and substantially greater than the painfully slow 10.3 percent growth in a typical worker’s annual compensation over the same period. Chief executive officers of America’s largest firms earn more than 2.5 times more than they did 20 years ago and at least seven times more than 30 years ago, despite a drop in compensation in 2015 corresponding to faltering stock prices in late 2015. The associated decline in the value of stock options—which reflects the current value of securities—led to fewer stock options cashed in and therefore depressed overall CEO compensation. Since the cashing in of fewer stock options accounted for more than 80 percent of the decline in pay from 2014 to 2015, CEO compensation in 2016 will almost certainly rebound as CEOs exercise their stock options to benefit from higher stock values. CEO pay has historically been closely associated with the health of the stock market. Amid a healthy recovery on Wall Street following the Great Recession, CEOs have enjoyed outsized income gains even relative to other very-high-wage earners. Outsized CEO pay growth has had spillover effects, pulling up the pay of other executives and managers, who constitute a larger group of workers than is commonly recognized.1 Consequently, the growth of CEO and executive compensation overall was a major factor driving the doubling of the income shares of the top 1 percent and top 0.1 percent of U.S. households from 1979 to 2007 (Bivens and Mishel 2013; Bakija, Cole, and Heim 2012). Since then, income growth has remained unbalanced: as profits have reached record highs along with stock market highs, the wages of most workers have continued to stagnate over the last dozen years or so (Bivens et al. 2014; Gould 2016). Average CEO compensation, for CEOs in the largest firms, was $15.5 million in 2015. This estimate uses a comprehensive measure of CEO pay that covers chief executives of the top 350 U.S. firms and includes the value of stock options exercised in a given year. Compensation is down 5.1 percent since 2014 (data available through May) but up 46.5 percent since the recovery began in 2009. The dip in top CEO compensation reflects a faltering stock market and a corresponding decline in the potential value of stock options. Most (83 percent) of the decline in CEO pay from 2014 to 2015 can be explained by the drop in the value of realized stock options in that period. Therefore the decline in compensation does not reflect any structural change in how CEO compensation is set or changes in corporate governance. CEO compensation will likely resume its upward trajectory when the stock market resumes upward movement. From 1978 to 2015, inflation-adjusted compensation of the top CEOs increased 940.9 percent, a rise 73 percent greater than stock market growth and substantially greater than the painfully slow 10.3 percent growth in a typical worker’s annual compensation over the same period. The CEO-to-worker compensation ratio, 20-to-1 in 1965, peaked at 376-to-1 in 2000 and was 276-to-1 in 2015—down from 302-to-1 in 2014 but still far higher than in the 1960s, 1970s, 1980s, or 1990s. Over the last three decades, compensation for CEOs grew far faster than that of other highly paid workers, i.e., those earning more than 99.9 percent of wage earners. CEO compensation in 2014 (the latest year for data on top wage earners) was 5.61 times greater than wages of the top 0.1 percent of wage earners, a ratio 2.43 points higher than the 3.18 ratio that prevailed over the 1947–1979 period. This wage gain alone is equivalent to the wages of 2.43 very-high-wage earners. That CEO pay grows far faster than pay of the top 0.1 percent of wage earners indicates that CEO compensation growth does not simply reflect the increased value of highly paid professionals in a competitive race for skills (the “market for talent”), but rather reflects the presence of substantial “rents” embedded in executive pay (meaning CEO pay does not reflect greater productivity of executives but rather the power of CEOs to extract concessions). Consequently, if CEOs earned less or were taxed more, there would be no adverse impact on output or employment. Also over the last three decades, CEO compensation increased more relative to the pay of other very-high-wage earners than the wages of college graduates rose relative to the wages of high school graduates: thus, the escalation of CEO pay does not simply reflect a more general rise in the returns to education. Critics of these analyses suggest looking at the pay of the average CEO, not CEOs of the largest firms. However, the average firm is very small, employing just 20 workers, and does not represent a useful comparison to the pay of a typical worker, defined here as an employee of a firm with roughly 1,000 workers. Workers in small firms are atypical: half (52 percent) of employment and 58 percent of total payroll are in firms with 500 or more employees, and firms with at least 10,000 workers account for 27.9 percent of all employment and 31.4 percent of all payroll. Table 1 presents trends in CEO compensation from 1965 to 2015.2 The data measure the compensation of CEOs in the largest firms and incorporate stock options according to how much the CEO realized in that particular year by exercising stock options available (buying stocks at a previously set price and reselling them at market price). The options-realized measure reflects what CEOs report as their Form W-2 wages for tax reporting purposes and is what they actually earned in a given year. This is the measure most frequently used by economists.3 In addition to stock options, the compensation measure includes salary, bonuses, restricted stock grants, and long-term incentive payouts. Full methodological details for the construction of this CEO compensation measure and benchmarking to other studies can be found in Mishel and Sabadish 2013. * CEO annual compensation is computed using the "options realized" compensation series, which includes salary, bonus, restricted stock grants, options exercised, and long-term incentive payouts for CEOs at the top 350 U.S. firms ranked by sales. Source: Authors' analysis of data from Compustat's ExecuComp database, Federal Reserve Economic Data (FRED) from the Federal Reserve Bank of St. Louis, the Current Employment Statistics program, and the Bureau of Economic Analysis NIPA tables. CEO compensation reported in Table 1, as well as throughout the rest of the report, is the average compensation of the CEOs in the top 350 publicly owned U.S. firms (i.e., firms that sell stock on the open market) with the largest revenue each year. Our sample each year will be fewer than 350 firms to the extent that these large firms did not have the same CEO for most of or all of the year or the compensation data are not yet available. For comparison, Table 1 also presents the annual compensation (wages and benefits of a full-time, full-year worker) of a private-sector production/nonsupervisory worker (a group covering more than 80 percent of payroll employment), allowing us to compare CEO compensation with that of a “typical” worker. From 1995 onward, the table identifies the average annual compensation of the production/nonsupervisory workers in the key industries of the firms included in the sample. We take this compensation as a proxy for the pay of typical workers in these particular firms. 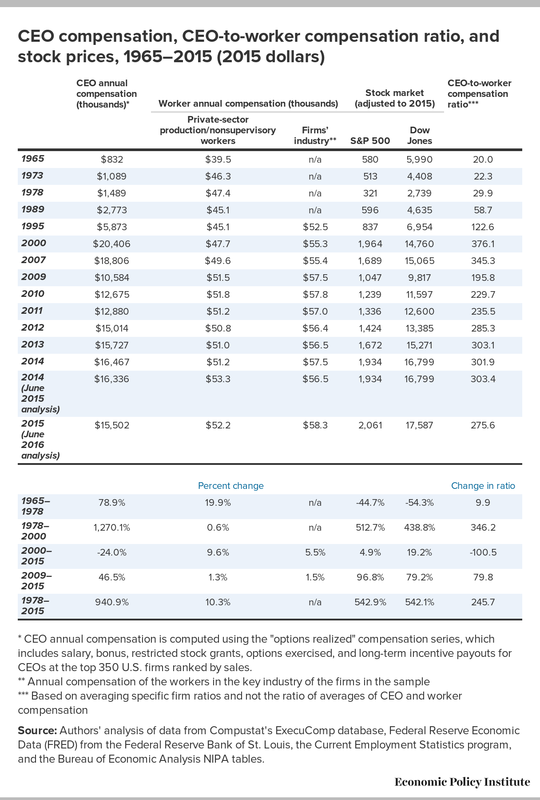 The modern history of CEO compensation (starting in the 1960s) is as follows. Even though the stock market, as measured by the Dow Jones Industrial Average and S&P 500 index and shown in Table 1, fell by roughly half between 1965 and 1978, CEO pay increased by 78.9 percent. Average worker pay saw relatively strong growth over that period (relative to subsequent periods, not relative to CEO pay or pay for others at the top of the wage distribution). Annual worker compensation grew by 19.9 percent from 1965 to 1978, only about a fourth as fast as CEO compensation growth over that period. CEO compensation grew strongly throughout the 1980s but exploded in the 1990s and peaked in 2000 at around $20 million, an increase of roughly 250 percent just from 1995 and 1,270 percent from 1978. This latter increase even exceeded the growth of the booming stock market—513 percent for the S&P 500 and 439 percent for the Dow from 1978 to 2000. In stark contrast to both the stock market and CEO compensation, private-sector worker compensation increased just 0.6 percent over the same period. The fall in the stock market in the early 2000s led to a substantial paring back of CEO compensation, but by 2007 (when the stock market had mostly recovered) CEO compensation returned close to its 2000 level. Figure A shows how CEO pay fluctuates in tandem with the stock market as measured by the S&P 500 index, confirming that CEOs tend to cash in their options when stock prices are high. The financial crisis in 2008 and the accompanying stock market tumble knocked CEO compensation down 44 percent between 2007 and 2009. By 2014, the stock market had recouped all of the ground lost in the downturn and, not surprisingly, CEO compensation had also made a strong recovery. In 2015, however, CEO pay receded from its 2014 peak. Note: CEO annual compensation is computed using the "options realized" compensation series, which includes salary, bonus, restricted stock grants, options exercised, and long-term incentive payouts for CEOs at the top 350 U.S. firms ranked by sales. Source: Authors' analysis of data from Compustat's ExecuComp database and Federal Reserve Economic Data (FRED) from the Federal Reserve Bank of St. Louis. Note that Table 1 provides the best metric for gauging the year-to-year change in CEO compensation, which is the comparison of the current (June 2016) measure of CEO pay in 2015 with the estimate of CEO pay for 2014 that derives from the data available in June 2015. This metric is best because CEO compensation for a full year’s data is higher than the compensation estimated from data available in late May of each year; using the late May data artificially lowers the estimate of comparing this year’s CEO compensation to that of last year (when last year is represented by full year data).4 CEO compensation in 2015 was $15,502,000, down 5.1 percent from the $16,336,000 measured in a similar sample for 2014. Over the entire period from 1978 to 2015, CEO compensation increased about 941 percent, a rise roughly 70 percent faster than stock market growth and substantially greater than the painfully slow 10.3 percent growth in a typical worker’s compensation over the same period. The decline in CEO compensation in 2015 is a clear break in trend so it is useful to get a better understanding of what drove this outcome. Was the decline in CEO compensation the result of a change in the fundamentals of how CEO pay is being set? (If so, we can expect further moderation ahead.) Or, was the decline in CEO compensation due to some temporary factors—thus leading us to expect the trajectory of CEO compensation to bounce back in 2016? Our analysis in this section shows that the decline in CEO compensation was largely driven by a falloff in the stock market that lowered the potential value of stock options and thus the value of realized stock options for CEOs. The resumption of stock market growth will presumably reestablish the higher level of CEO compensation and the upward trajectory in the coming years. Understanding the CEO compensation decline in 2015 requires us to examine how the components of compensation changed for CEOs and for how many CEOs. 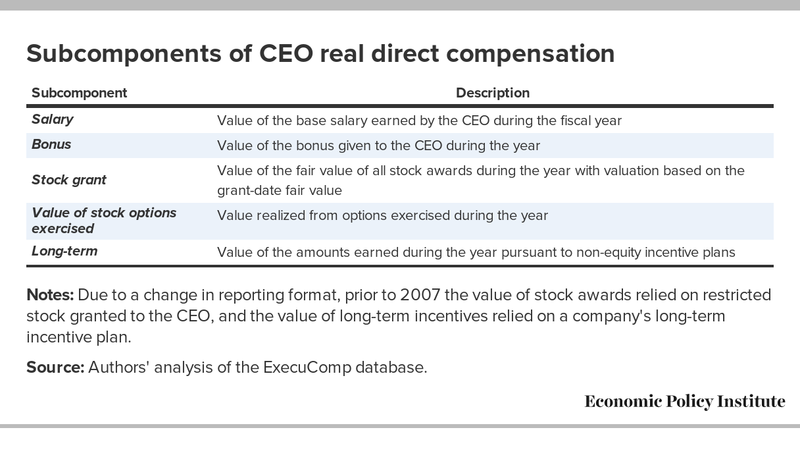 Table 2 presents the relevant data for each subcomponent (defined in Box A) of compensation and for each fifth of CEOs ranked by compensation. *Only firms for which company names were identical in both years were included. **Firms were categorized into fifths according to real CEO compensation. Notes: Due to a change in reporting format, prior to 2007 the value of stock awards relied on restricted stock granted to the CEO, and the value of long-term incentives relied on a company's long-term incentive plan. Source: Authors' analysis of the ExecuComp database. The top panel examines a sample of the 314 firms that appear in both our 2014 and 2015 samples—the “stayers”—to avoid having the composition of firms affect the results. The bottom panel, Panel B, includes both “stayers” and firms that only appeared in one of the years. The compensation decline among the stayers-only was just 3.2 percent, a smaller decline than the 5.9 percent decline in the larger samples for each year.5 This suggests that part of the overall decline was the change in the composition of firms such that firms that joined the sample had lower CEO pay than those that were no longer in the sample. The 3.2 percent decline in CEO compensation of the stayers is completely explained by the decline in realized stock options which fell $697,000 (or 11.1 percent) in 2015, greater than the overall decline of $536,000 in CEO compensation. We document below that this falloff in realized stock options reflects the decline in the overall value of stock options that could have been realized, the result of faltering stock prices. The second panel of Table 2 presents the changes in each subcomponent of CEO compensation for each fifth of the CEOs based on where they fall in the total real compensation distribution, for our 2014 and 2015 samples. This analysis again shows the key role played by the shrinkage of realized stock options, which explains $800,000 of the overall compensation decline of $965,000. That is, a drop in realized stock options can account for 83 percent of the 5.9 percent decline in CEO pay from 2014 (when it was $16.5 million) to 2015 (when it was $15.5 million). Interestingly, among the highest paid CEOs (and the second fifth) it was the decline in the value of stock grants that was most important. Among the remainder of the CEOs it was the falloff in realized stock options that drove the overall compensation decline. 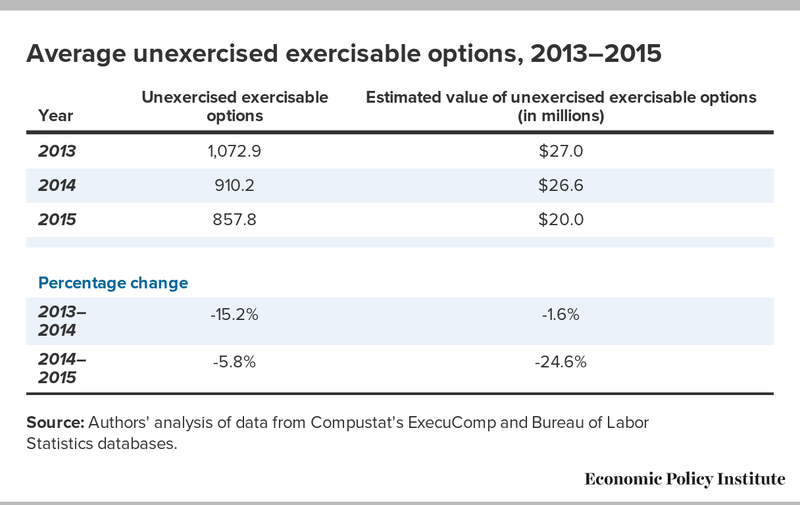 Table 3 shows that the average value of unexercised exercisable options among CEOs included in our sample fell 24.6 percent, from $26,557,000 to $20,026,000. The sharp drop in the estimated value of these options points is primarily due to the subdued values of the stock prices rather than a cutback of options available (which fell by 5.8 percent). The underlying dynamic appears to be lower stock prices that lowered the value of stock options and led to CEOs cashing in fewer stock options in 2015. Source: Authors' analysis of data from Compustat's ExecuComp and Bureau of Labor Statistics databases. It is easier to understand this falloff in realized stock options when one examines the monthly trends in the stock market over 2014–2015. According to the data in Figure B, after starting 2015 at 2,058 points, the S&P largely stagnated over the first two quarters of the year. The underlying data to Figure B show that the S&P averaged 2,064 points in the first quarter and then climbed to an average of 2,102 points in the second quarter. Starting in August 2015, however, the S&P dipped twice, nearly matching a trough hit in October 2014, before finishing with a weak fourth quarter averaging 2,052 points. 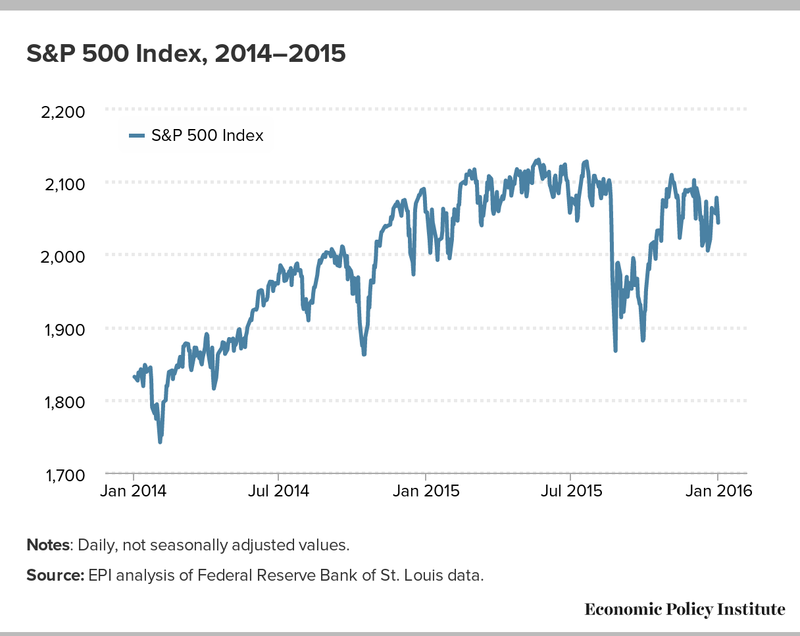 The S&P 500 ended 2015 about three-quarters of a percent down from where it had begun 2015. Stock values were 2.1 percent lower in the last half of the year than in the first half so, not surprisingly, the value of stock options fell and fewer executives exercised available options. Notes: Daily, not seasonally adjusted values. Source: EPI analysis of Federal Reserve Bank of St. Louis data. The decline in CEO compensation in 2015 reaffirms the alignment of CEO compensation with the ups and downs of the stock market. This tight relationship between overall stock prices and CEO compensation casts doubt on the theory that CEOs are enjoying high and rising pay because their individual productivity is increasing (either because they head larger firms, have adopted new technology, or for other reasons. CEO compensation often grows strongly simply when the overall stock market rises and individual firms’ stock values rise along with it. This is a marketwide phenomenon and not one of improved performance of individual firms: most CEO pay packages allow pay to rise whenever the firm’s stock value rises and permit CEOs to cash out stock options regardless of whether the rise in the firm’s stock value was exceptional relative to comparable firms. Table 1, which informed our discussion of general CEO compensation trends earlier, also presents the trend in the ratio of CEO-to-worker compensation. 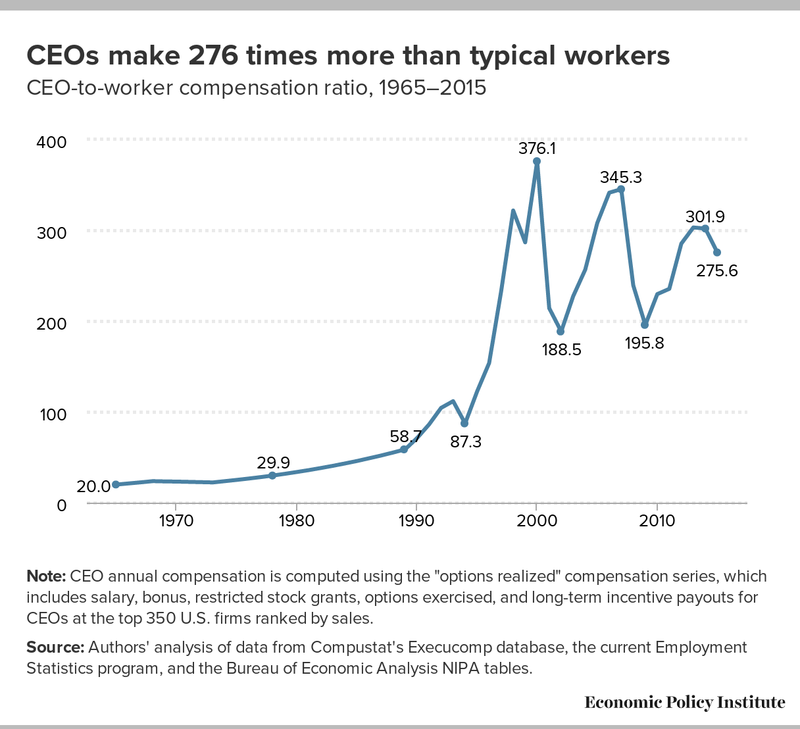 This overall ratio, which illustrates the increased divergence between CEO and worker pay over time, is computed in two steps. The first step is to construct, for each of the largest 350 U.S. firms, the ratio of the CEO’s compensation to the annual average compensation of production and nonsupervisory workers in the key industry of the firm (data on the pay of workers in any particular firm are not available). The second step is to average that ratio across all the firms. The last column in Table 1 is the resulting ratio in select years. The trends prior to 1995 are based on the changes in average top-company CEO and economy wide private-sector production/nonsupervisory worker compensation. The year-by-year trend is presented in Figure C.
Source: Authors' analysis of data from Compustat's Execucomp database, the current Employment Statistics program, and the Bureau of Economic Analysis NIPA tables. CEOs of major U.S. companies earned 20 times more than a typical worker in 1965; this ratio grew to 30-to-1 in 1978 and 59-to-1 by 1989, and then it surged in the 1990s, hitting 376-to-1 by the end of the 1990s recovery, in 2000. The fall in the stock market after 2000 reduced CEO stock-related pay (e.g., realized stock options) and caused CEO compensation to tumble until 2002 and 2003. CEO compensation recovered to a level of 345 times worker pay by 2007, almost back to its 2000 level. The financial crisis in 2008 and accompanying stock market decline reduced CEO compensation after 2007–2008, as discussed above, and the CEO-to-worker compensation ratio fell in tandem. By 2014, the stock market had recouped all of the value it lost following the financial crisis and the CEO-to-worker compensation ratio in 2014 had recovered to 302-to-1. As discussed above, a dip in the stock market and the value of associated stock options led to a decline in CEO compensation in 2015 and, correspondingly, the CEO-to-worker pay ratio fell to 276-to-1, similar to what happened in other stock market declines at the start of the new millennium and during the Great Recession. Though the CEO-to-worker compensation ratio remains below the peak values achieved earlier in the 2000s, it is far higher than what prevailed through the 1960s, 1970s, 1980s, and 1990s. Does rising CEO pay simply reflect the market for skills? Over the last 20 years, then, public company CEO pay relative to the top 0.1 percent has remained relatively constant or declined. These patterns are consistent with a competitive market for talent. They are less consistent with managerial power. Other top income groups, not subject to managerial power forces, have seen similar growth in pay. The point of these comparisons is to confirm that while public company CEOs earn a great deal, they are not unique. Other groups with similar backgrounds—private company executives, corporate lawyers, hedge fund investors, private equity investors and others—have seen significant pay increases where there is a competitive market for talent and managerial power problems are absent. Again, if one uses evidence of higher CEO pay as evidence of managerial power or capture, one must also explain why these professional groups have had a similar or even higher growth in pay. It seems more likely that a meaningful portion of the increase in CEO pay has been driven by market forces as well. But the argument that CEO compensation is being set by the market for “skills” does not square with the data. Bivens and Mishel (2013) address the larger issue of the role of CEO compensation in generating income gains at the very top and conclude that there are substantial rents embedded in executive pay, meaning that CEO pay gains are not simply the result of a competitive market for talent but rather reflect the power of CEOs to extract concessions. We draw on and update that analysis to show that CEO compensation grew far faster than compensation of the category of highly paid workers over the last few decades, which suggests that the market for skills was not responsible for the rapid growth of CEO compensation. To reach this finding we employ Kaplan’s own series on CEO compensation and compare it with the incomes of top households, as he does, but also compare it with a better standard, the wages of top wage earners, rather than the household income of the top 0.1 percent.6 We update Kaplan’s series beyond 2010 using the growth of CEO compensation in our own series. This analysis finds, contrary to Kaplan, that compensation of CEOs has far outpaced that of very highly paid workers, the top 0.1 percent of earners. Table 4 compares the ratio of the average compensation of chief executive officers of large firms, the series developed by Kaplan, with two benchmarks. The first benchmark is the one Kaplan employs: the average household income of those in the top 0.1 percent, data developed by Piketty and Saez (2015). The second is the average annual earnings of the top 0.1 percent of wage earners based on a series developed by Kopczuk, Saez, and Song (2010) and updated in Mishel and Kimball 2015. Each ratio is presented as a simple ratio and logged (to convert to a “premium,” defined as the relative pay differential between one group and another). The wage benchmark seems the most appropriate one since it avoids issues of household demographics—changes in two-earner couples, for instance—and limits the income to labor income (i.e., excluding capital income). Both the ratios and log ratios clearly understate the relative wage of CEOs since CEO pay is a nontrivial share of the denominator, a bias that has probably grown over time simply because CEO relative pay has grown (in other words if we were able to remove these CEOs’ pay from the broader top 0.1 percent category the average for the broader group would be lower).7 For comparison purposes Table 4 also shows the changes in the gross (not regression-adjusted) college-to-high-school wage premium. This premium, which is simply how much more pay is earned by workers with a college degree relative to workers without one, is also useful because some commentators, such as Mankiw (2013), have asserted that the top 1 percent wage and income growth reflects the general rise of the return to skills as reflected in higher college wage premiums. The comparisons end in 2014 because 2015 data for top 0.1 percent wages (or household incomes) are not yet available. Source: Authors' analysis of Mishel and Kimball 2015 and Piketty and Saez 2014. Income inequality from Piketty and Saez, “Income Inequality in the United States, 1913-1998, Quarterly Journal of Economics, 118(1), 2003, 1-39. Updated data for this series and other countries, is available at the Top Income Database. Updated 2016. CEO compensation grew from 1.14 times the income of the top 0.1 percent of households in 1989 to 2.54 times in 2013. In 2014, the pace of CEO pay growth as compared with the income of households in the top 0.1 percent fell slightly to 2.34 times. In 2014 CEO pay was 5.61 times the pay of the top 0.1 percent of wage earners, down from 2013 but substantially higher than in 2007. 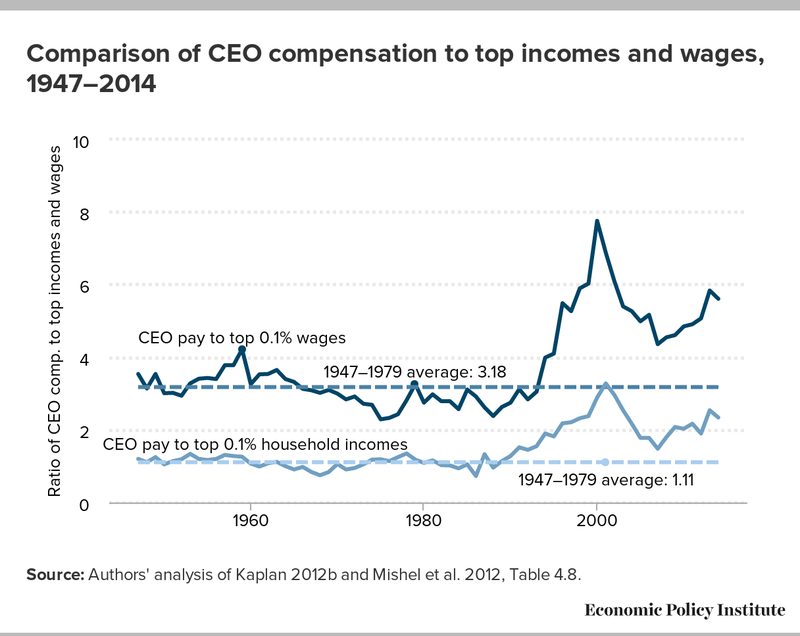 CEO pay relative to the pay of the top 0.1 percent of wage earners in 2014 far exceeded the ratio of 2.63 in 1989, a rise (2.98) equal to the pay of roughly three very high earners. 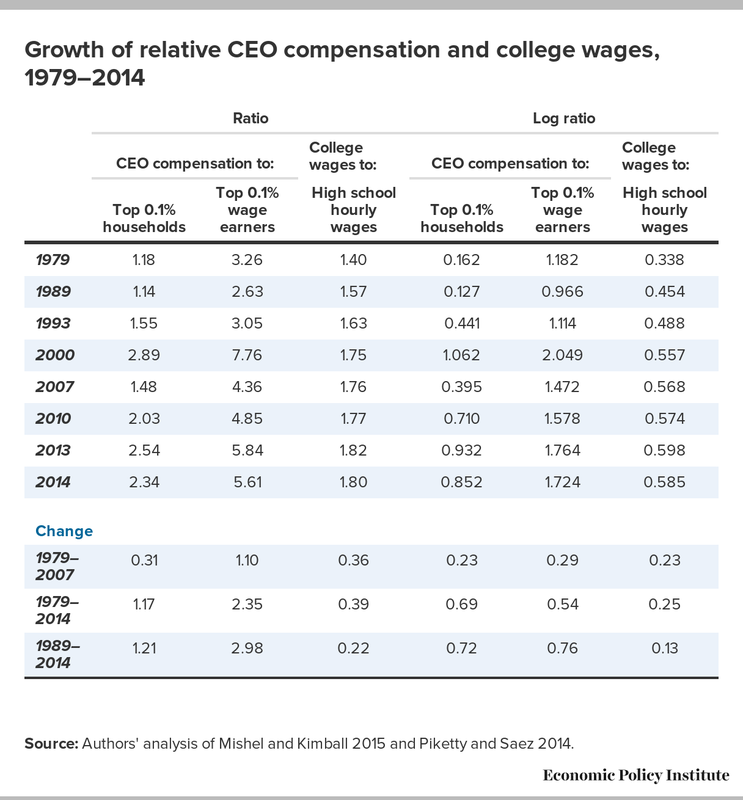 The log ratio of CEO relative pay grew 72 log points from 1989 to 2014 using top 0.1 percent household incomes and 76 log points using wage earners as the comparison. Source: Authors' analysis of Kaplan 2012b and Mishel et al. 2012, Table 4.8. If CEO pay growing far faster than that of other high earners is a test of the presence of rents, as Kaplan has suggested, then we would conclude that today’s top executives receive substantial rents, meaning that if they were paid less there would be no loss of productivity or output. The large discrepancy between the pay of CEOs and other very-high-wage earners also casts doubt on the claim that CEOs are being paid these extraordinary amounts because of their special skills and the market for those skills. Is it likely that the skills of CEOs in very large firms are so outsized and disconnected from the skills of others that they propel CEOs past most of their cohorts in the top tenth of a percent? No. For everyone else the distribution of skills, as reflected in the overall wage distribution, tends to be much more continuous. What about the average CEO? A relatively new critique of examining the pay of CEOs in the largest firms, as we do, is that such efforts are misleading. For instance, American Enterprise Institute scholar Mark Perry (2015) says the samples of CEOs examined by the Associated Press, the Wall Street Journal, or our earlier work “aren’t very representative of the average U.S. company or the average U.S. CEO,” because “the samples of 300–350 firms for CEO pay represent only one of about every 21,500 private firms in the U.S., or about 1/200 of 1% of the total number of U.S. firms.” Perry notes, “According to both the BLS and the Census Bureau, there are more than 7 million private firms in the U.S.” Perry considers the pay of the average CEO, $187,000, to be a much more important indicator. This is a clever but misguided critique. Amazingly, roughly 16 percent of the CEOs in Perry’s preferred measure are in the public sector. And those in the private sector include CEOs of religious organizations, advocacy groups, and unions. One wonders why Perry is not critical of the Bureau of Labor Statistics’ measure of CEO pay, since BLS reports that there are only 207,660 private-sector CEOs, far short of the 5.7 million there would be if each private firm had one. The shortfall of CEOs in the BLS data is understandable, however, once one recognizes that the average firm has only 20.2 workers (Caruso 2015, Appendix Table 1). The 5.1 million firms with fewer than 19 employees, averaging four employees per firm, probably do not have a CEO. Of the remaining 596,000 firms apparently 388,000 do not have CEOs either (given that BLS reports only 207,660 private-sector CEOs). The reason to focus on the CEO pay of the largest firms is that they employ a large number of workers, are the leaders of the business community, and set the standards for pay in the executive pay market and probably do so in the nonprofit sector as well (e.g., hospitals and universities). No agency reports how many workers work for very large firms. We do know from census data (Caruso 2015, Appendix Table 1) that the 18,219 firms in 2012 with at least 500 employees employed 51.6 percent of all employees and their payrolls accounted for 58.1 percent of total payroll (wages multiplied by employment). County Business Patterns data (U.S. Census Bureau 2012) provide a breakout of the 964 firms (just 0.017 percent of all firms) with at least 10,000 employees; these large firms provide 27.9 percent of all employment and 31.4 percent of all payroll. In other words, the average or median employee works in a larger firm, and the CEO there looks far different than the CEO of the “average U.S. company” in which Perry purports to be interested. This is further confirmed by a new study that reports that the median firm, ranked by employment, has roughly 1,000 workers while the average firm has about 20 (Song et al. 2015). Executives and managers comprise a large portion of those in the top 1 percent of income and the top 1 percent of wage earners. The analysis of tax returns in Bakija, Cole, and Heim 2012 shows the composition of executives in the households with the highest incomes; our tabulation of American Community Survey data for 2009–2011 shows that 41.2 percent (the largest group) of those heading a household in the top 1 percent of incomes were executives or managers. Thus, we know that highly paid managers are the largest group in the top 1 percent and the top 0.1 percent, measured in terms of either wages or household income, and so there are plenty of good reasons to be interested in the pay of executives of large firms. Moreover, the pay of CEOs in the largest firms has grown multiple times faster than the wages of other very high earners and hundreds of times faster than the wages these CEOs provide to their workers. CEO compensation did fall in 2015. Our analysis suggests that this is a temporary setback related to what we expect to be a temporary decline in the stock market. The fall in CEO compensation does not seem to reflect any fundamental change in the mechanisms for setting such pay. Therefore, new policies are certainly required to address excessive CEO compensation. There are policy options for curtailing escalating executive pay and broadening wage growth. Some involve taxes. Implementing higher marginal income tax rates at the very top would limit rent-seeking behavior and reduce the incentives for executives to push for such high pay. Legislation has also been proposed that would remove the tax break for executive performance pay that was established early in the Clinton administration; by allowing the deductibility of performance pay, this tax change helped fuel the growth of stock options and other forms of such compensation. Another option is to set corporate tax rates higher for firms that have higher ratios of CEO-to-worker compensation. Other policies that can potentially limit executive pay growth are changes in corporate governance, such as greater use of “say on pay,” which allows a firm’s shareholders to vote on top executives’ compensation. – The authors thank the Stephen Silberstein Foundation for generous support of this research. Lawrence Mishel is president of the Economic Policy Institute and was formerly its research director and then vice president. He is the co-author of all 12 editions of The State of Working America. He holds a Ph.D. in economics from the University of Wisconsin at Madison, and his articles have appeared in a variety of academic and nonacademic journals. His areas of research are labor economics, wage and income distribution, industrial relations, productivity growth, and the economics of education. Jessica Schieder joined EPI in 2015 as a research assistant. She assists EPI’s researchers in their ongoing analysis of the labor force, labor standards, and other aspects of the economy. Schieder aids in the design and execution of research projects in areas such as income inequality, the gender wage gap, and immigration. She also works with the Economic Analysis and Research Network (EARN) to provide research support to various state advocacy organizations. Schieder has previously worked for the Center for Effective Government (formerly OMB Watch) and the U.S. Senate. She holds a B.S.F.S. from Georgetown University. 1. In 2007, according to the Capital IQ database, there were 38,824 executives in publicly held firms (tabulations provided by Temple University Professor Steve Balsam). There were 9,692 in the top 0.1 percent of wage earners. 2. The years chosen are based on data availability, though where possible we chose cyclical peaks (years of low unemployment). 3. For instance, all of the papers prepared for the symposium on the top 1 percent, published in the Journal of Economic Perspectives (summer 2013), used CEO pay measures with realized options. Bivens and Mishel (2013) follow this approach because the editors asked them to drop references to the options-granted measure. 4. Most Fortune 500 companies release annual financial data in early spring, prior to the release of this report. However, we include in our retrospective analyses of past years all data that was released during each calendar year. This creates a bias in our June data, when compared with the consecutive year’s release: for both 2013 and 2014 the full year’s data shows higher CEO compensation than the data available by June. This means that a comparison of data available in June shows a lesser increase when comparing with last year’s full data than a comparison with the data that were available at the same time a year earlier. We have analyzed the impact of this bias and found that the vast majority of top firms remain unchanged over the course of the year, however there is a churn among the firms closer to the cutoff for our sample, the smaller firms. Among these firms with lower net annual sales, average CEO compensation tends to increase over the course of the year. Additionally, firms reporting later in the year have tended in recent years to be firms with relatively lower worker compensation levels, and so higher CEO-to-worker compensation ratios. 5. Note that this table compares full year 2014 data with 2015 data available through the end of May 2016. 6. We thank Steve Kaplan for sharing his series with us. 7. Temple University Professor Steve Balsam provided tabulations of annual W-2 wages of executives in the top 0.1 percent from the Capital IQ database. The 9,692 executives in publicly held firms who were in the top 0.1 percent of wage earners had average W-2 earnings of $4,400,028. Using Mishel et al. 2012 estimates of top 0.1 percent wages, executive wages make up 13.3 percent of total top 0.1 percent wages. One can gauge the bias of including executives in the denominator by noting that the ratio of executive wages to all top 0.1 percent wages in 2007 was 2.14, but the ratio of executive wages to nonexecutive wages was 2.32. Unfortunately, we do not have data that permit an assessment of the bias in 1979 or 1989. We also do not have information on the number and wages of executives in privately held firms; their inclusion would clearly indicate an even larger bias. The IRS reports there were nearly 15,000 corporate tax returns in 2007 of firms with assets exceeding $250 million, indicating there are many more executives of large firms than just those in publicly held firms. 8. Kaplan (2012b, 14) notes that the Frydman and Saks series grew 289 percent, while the Hall and Leibman series grew 209 percent. He also notes that the Frydman and Saks series grows faster than that reported by Murphy (2012). 9. The discussion in this paragraph is taken from Bivens and Mishel 2013. Bakija, Jon, Adam Cole, and Bradley Heim. 2010. “Job and Income Growth of Top Earners and the Causes of Changing Income Inequality: Evidence from U.S. Tax Return Data.” Department of Economics Working Paper 2010-24, Williams College. Balsam, Steven. 2013. Equity Compensation: Motivations and Implications. Washington, DC: WorldatWork Press. Bebchuk, Lucian, and Jesse Fried. 2004. Pay without Performance: The Unfulfilled Promise of Executive Remuneration. Cambridge, MA: Harvard University Press. Bivens, Josh, Elise Gould, Lawrence Mishel, and Heidi Shierholz. 2014. “Raising America’s Pay: Why It’s Our Central Economic Policy Challenge.” Economic Policy Institute, Briefing Paper #378. Bivens, Josh, and Lawrence Mishel. 2013. “The Pay of Corporate Executives and Financial Professionals as Evidence of Rents in Top 1 Percent Incomes.” Economic Policy Institute, Working Paper #296. Bureau of Economic Analysis. Various years. National Income and Product Accounts Tables [online data tables]. Tables 6.2C, 6.2D, 6.3C, and 6.3D. 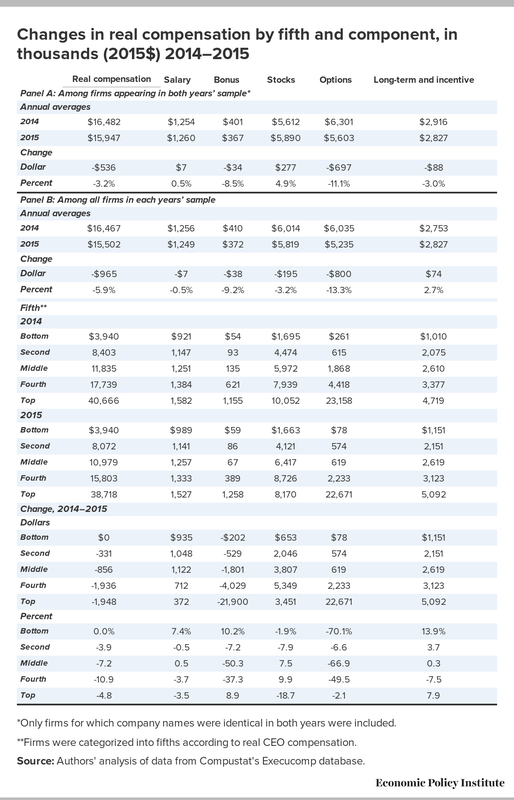 Bureau of Labor Statistics. Various years. Business Employment Dynamics. Public data series. Bureau of Labor Statistics. Various years. Current Employment Statistics. Public data series. Employment, Hours and Earnings-National [database]. Caruso, Anthony. 2015. “Statistics of U.S. Businesses Employment and Payroll Summary: 2012.” U.S. Census Bureau. Compustat. Various years. ExecuComp database [commercial database product accessible by purchase]. Federal Reserve Bank of St. Louis. Various years. Federal Reserve Economic Data (FRED) [database]. Frydman, Carola, and Raven E. Saks. 2010. “Executive Compensation: A New View From a Long-Term Perspective, 1936–2005.” Review of Financial Studies 23, 2099–138. Gould, Elise. 2016. “Wage Inequality Continued Its 35-Year Rise in 2015.” Economic Policy Institute, Issue Brief #421. Hall, Brian J., and Jeffrey B. Liebman. 1997. “Are CEOs Really Paid like Bureaucrats?” National Bureau of Economic Research, Working Paper #6213. Kaplan, Steven N. 2012a. “Executive Compensation and Corporate Governance in the U.S.: Perceptions, Facts, and Challenges.” Martin Feldstein Lecture. National Bureau of Economic Research, Washington, DC, July 10. Kaplan, Steven N. 2012b. “Executive Compensation and Corporate Governance in the U.S.: Perceptions, Facts, and Challenges.” National Bureau of Economic Research, Working Paper #18395. Kopczuk, Wojciech, Emmanuel Saez, and Jae Song. 2010. “Earnings Inequality and Mobility in the United States: Evidence from Social Security Data since 1937.” Quarterly Journal of Economics 125, no. 1: 91–128. Mankiw, N. Gregory. 2013. “Defending the One Percent.” Journal of Economic Perspectives 27, no. 3: p. 21-24. Mishel, Lawrence. 2013a. “Greg Mankiw Forgets to Offer Data for His Biggest Claim.” Working Economics (Economic Policy Institute blog), June 25. Mishel, Lawrence. 2013b. “Working as Designed: High Profits and Stagnant Wages.” Working Economics (Economic Policy Institute blog), March 28. Mishel, Lawrence, Josh Bivens, Elise Gould, and Heidi Shierholz. 2012. The State of Working America, 12th Edition. An Economic Policy Institute book. Ithaca, NY: Cornell University Press. Mishel, Lawrence, and Will Kimball. 2015. “Wages for Top Earners Soared in 2014: Fly Top 0.1 Percent, Fly” Working Economics (Economic Policy Institute blog), November 3. Mishel, Lawrence, and Natalie Sabadish. 2013. “Methodology for Measuring CEO Compensation and the Ratio of CEO-to-Worker Compensation.” Economic Policy Institute Working Paper #298. Murphy, Kevin. 2012. “The Politics of Pay: A Legislative History of Executive Compensation.” University of Southern California Marshall School of Business Working Paper #FBE 01.11. Perry, Mark. 2015. “When We Consider All US ‘Chief Executives,’ the ‘CEO-to-Worker Pay Ratio’ Falls from 331:1 to Below 4:1.” AEI Ideas (American Enterprise Institute blog), May 1. Piketty, Thomas, and Emmanuel Saez. 2015. “Income Inequality in the United States, 1913–1998” Quarterly Journal of Economics 118, no. 1, 1–39, tables and figures updated to 2013 in Excel format, January 2015. Song, Jae, David J. Price, Faith Guvenen, and Nicholas Bloom. 2015. “Firming Up Inequality.” National Bureau of Economic Research Working Paper #21199. U.S. Census Bureau. 2012. “Number of Firms, Number of Establishments, Employment, and Annual Payroll by Large Enterprise Employment Sizes for the United States, NAICS Sectors: 2012.” County Business Patterns.